They are spreading God’s love by feeding others! For each box shipped, they donate 5 meals to Feeding America. 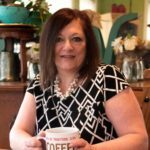 They support Christian authors, artists and creators and include products made by them. Don't Miss Any Giveaways. Sign Up For Our Newsletter! I received my first box on December 6th and was so excited to dig in to see what was in the box. 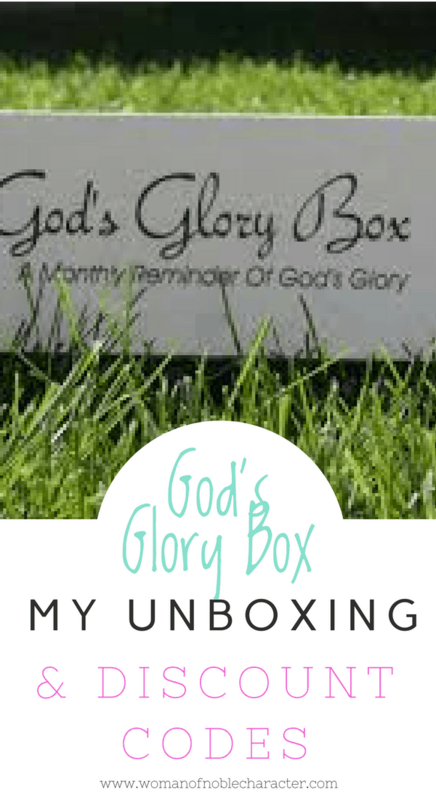 Take a look at my “unboxing” my first God’s Glory Box. 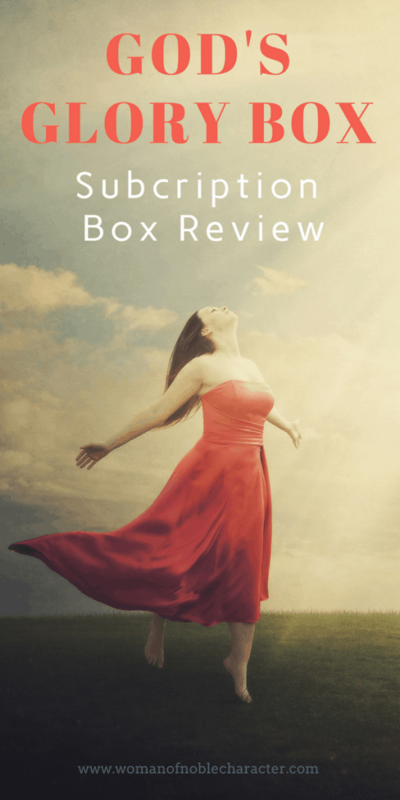 I’m such a fan of God’s Glory Box and have even included them on my list of gits for Christian women. 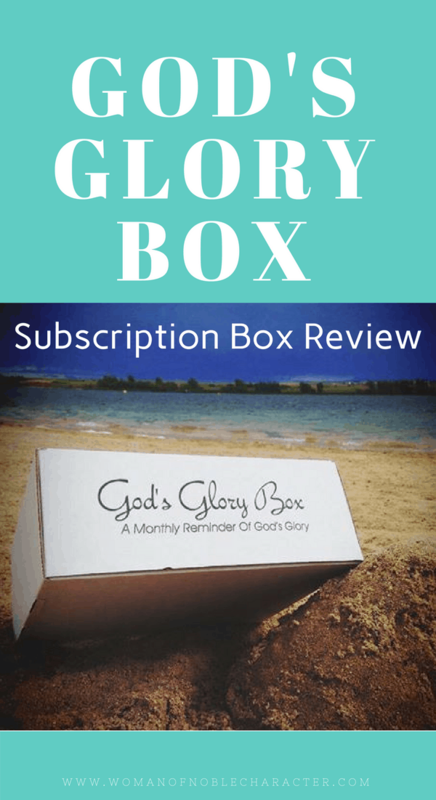 A one month or longer subscription to God’s Glory Box is an amazing gift for the Christian woman (or any Christian) in your life. 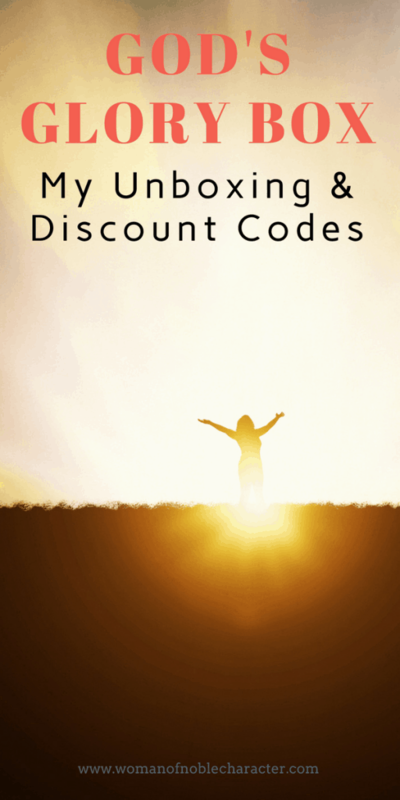 Here’s the best part, God’s Glory Box has given me a discount code just for Woman of Noble Character readers! Yes, you can get $5 off a one-month box or $10 off any subscription longer than one month. Isn’t that wonderful and so very generous of them! Use these codes to get your discount and be sure to let me know when you receive your first box – I can’t wait to hear how much you love it! 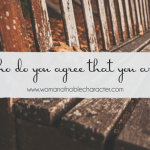 Who do you agree that you are? Previous Post: « Do You Need to Know How to Sew to Be a Woman of Noble Character? Wow! A great way to receive and give God’s word! What a blessing! I loved my God’s Glory Box! Thank you for visiting! Such a great idea and the items really do look like quality things to enjoy and encourage! They really are awesome! I loved mine! Check them out for gifts! This looks like a great gift box to give & to receive, great items for digging deeper in the Word! 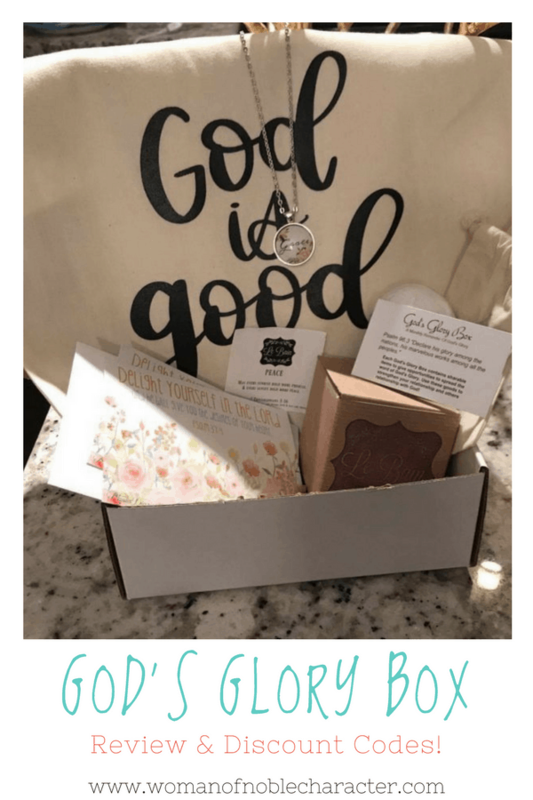 I’d love to receive God’s Glory box! Great gift idea too! It really is a great gift idea! Merry Christmas and thanks for stopping by Woman of Noble Character! Life is hard and I think receiving this would bring some sunshine to my life. God is good and his glory always brings sunshine to the darkness on earth. Thank you for stopping by! It is a great idea! I plan on giving a few as gifts. Merry Christmas and thank you for stopping by! Would love to have this right now. It’s been a really hard month. I’m so sorry to hear that! I’ll keep you in my prayers (God knows what you need! :)) Thanks for stopping by. I have not heard if these but what a great idea. I especially love that meals are provided for the hungry for each purchase. What a wonderful way to pay it back/forward. Thank you for the chance to win the January box. This is such a cool idea! As a Christian artist myself I am so intrigued and want to know more. So I’d love to receive a box! That’s awesome! I’d love to check out your work. Thanks for stopping by! I would love to get these every month, for myself but also to use as encouragement for other Christian women in my life! 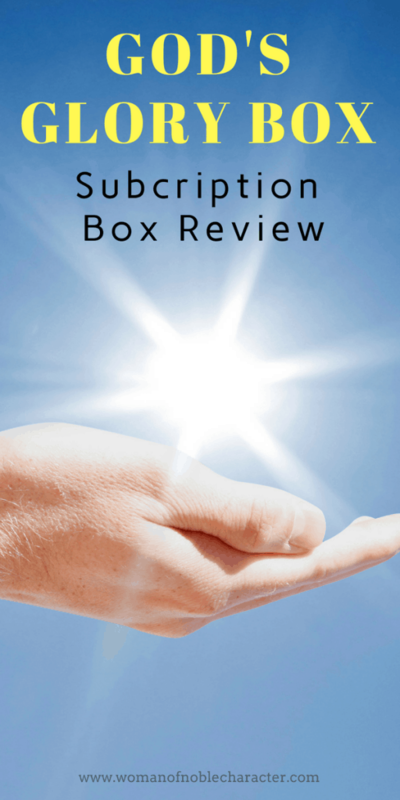 I always see the advertising for God’s glory box! I am really thinking about signing up! I love sharing God’s word! 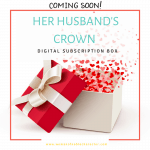 It really is an amazing subscription box! Be sure to use the code in the post for a discount 🙂 Thanks for stopping by!